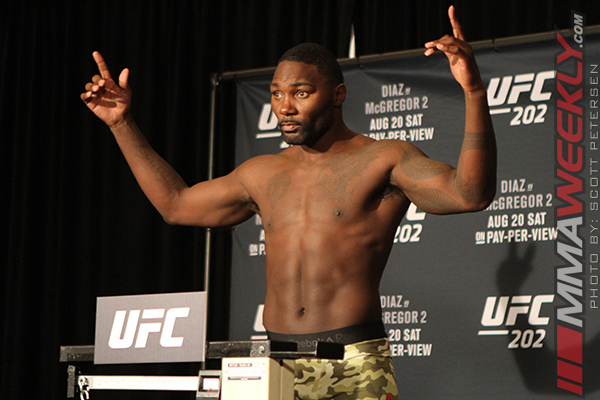 When Anthony “Rumble” Johnson made a surprise announcement about his retirement following his last fight in the UFC against Daniel Cormier in 2017, many believed it would only be a matter of time before he returned. Now more than two years later, Johnson has absolutely no regrets about his decision to call it a career and still has no plans to ever fight again. “Nah, never,” Johnson responded to MMAWeekly when asked if he misses the sport. “I respect the sport obviously. If I miss anything, I miss being around my teammates. I miss being around those guys and being able to laugh and joke and see the progress and the growth of those fighters. Watching Kamaru Usman start from scratch and seeing him now, he’s the champion. I miss seeing those guys grow but it kind of brings joy to my heart that they’re successful and they’re doing even better than I did. I’m extremely happy for everyone. When he retired, Johnson didn’t have concrete plans about what he would do next but he still knew the time was right to walk away. There aren’t pension plans for fighters who compete in the UFC or any other major mixed martial arts promotion and Johnson admits he had lofty expectations about the money he would earn during his career that would allow him to live comfortably for the rest of his life. In the aftermath of his retirement, Johnson started hustling to put together a game plan to ensure that he would be successful outside of fighting. He launched his own CBD oil company and just recently signed on as the head of fighter relations for Bare Knuckle Fighting Championships (BKFC). Johnson is still fighting for everything he’s got but he’s no longer taking punches to the head to get it. “I just started getting burned out from the sport. The same routine, the same everything. You’re kind of a robot programmed to do certain things. So when I saw an opportunity for business, I always wanted to be a businessman and I jumped on it,” Johnson explained. “All of a sudden, I got a CBD oil company called Competitive Body Development and so far I’m loving it. It’s cool being a businessman. This weekend, BKFC will promote their fifth card in the past year with two former UFC fighters headlining the show as Artem Lobov faces Jason Knight in the main event. Former ‘Ultimate Fighter’ season one competitor Chris Leben is also on the card and multi-time boxing champion Paulie Malignaggi just recdently signed with the promotion as well. Johnson has been amazed by what he’s seen out of BKFC so far and it’s only encouraged him to tackle his new job with even more exuberance as he plans for the future. Johnson has a lot on his plate as an executive with BKFC and that’s exactly where he wants to be in his career right now. There are no plans to fight again and if anything, Johnson is only looking to further expand his business acumen in the coming years. When he called it a career, Johnson knew the time was right and now he’s onto bigger and better things outside the cage. “I think most guys know when to call it quits. They just don’t want to. I knew when to quit,” Johnson said.